Rewind some 1.5 years back, I too was mulling over the exact same question, weighing the pros & cons, analyzing future career prospects and assessing several parameters that were important to me while selecting a college to pursue my MBA. Being a CAT aspirant, my dream was always to make it to a well-recognized & respected IIM brand but the major decision to take was whether to do an MBA from a newly established IIM. After having spent a good 15 months at Indian Institute of Management Amritsar and having known the institute inside and out, I shall now be able to present my first hand experience. I will try to avoid any bias that comes to my mind and be objective, critical and exhaustive with my analysis. When we look from the selection committee’s point of view, they generally favor either stellar merit or diversity, I do not particularly feel enthusiastic to boast about my quintessential Indian students’ profile: I am a typical science-mathematics student with an electrical engineering degree from a private college that falls under the purview of Rajasthan Technical University. At earlier stage of my career, I had always felt lack of guidance & less seriousness on my part to not have paid ample attention to where my career trajectory was leading. Despite of all that, I always managed to score a decent 80 plus percentage throughout my career without ever being diligent about my academics. All of it was about to change in the final year of my engineering when I began to introspect earnestly about my interests and career which led me to prepare wholeheartedly for CAT. It was the time when I ditched an IT-company placement offer in hand and joined a digital marketing start-up. My 14-month stint there unleashed a budding field of Social Media & Digital Marketing and I became enthused about learning new techniques on a daily basis. Side by side, I also was religiously preparing for my B-school entrance exams and was attempting 2-3 mocks per week. Growing by Leaps & Bounds: IIM Amritsar is undoubtedly a rapidly growing institute and has broken all growth records ever since its inception in 2015. The one reason I considered going there was precisely that. To increasing its batch size to 110 from the second batch itself, from securing 100% placements of this large pool with increase in the average package, hiring of new faculty members every quarter, improving the infrastructural facilities, proliferation of industry interaction and student initiatives, students proving their mettle in B-school competitions, etc. IIM Amritsar truly presents a case of boundless growth like a newly created start-up. Setting up the Culture: I think while joining a new institute, one must also consider their expectations and personality. Some people want to be a part of an established legacy and to be honest, legacy and alumni base do matter up to some extent. But when it comes to new IIMs like IIM Amritsar, there is a lot that is expected out of a current student. Students must be prepared that there are still many things that are to be put in place and that has to be set up by the collective efforts of first five batches of the institute. I personally enjoy the whole process of taking initiatives and it’s actually pretty great when you have a vision and think of an idea of how the club, committees, conclaves, competitions, fests, campaigns, etc. would be. From ideation to execution, laying the foundation stone of these novel things has indeed been an enriching experience. IIM Brand: I was excited to be the part of the IIM-system ever since the beginning because I always valued the coveted ‘IIM tag’ above everything else. And being here solidifies the fact that a well-recognized brand name truly matters. Be it placements or guest seminars, people really look forward to interacting with IIM students & even though it is indeed a double-edged sword that comes with huge responsibility of living up to their expectations. With the fourth academic year of the institute, this IIM tag would certainly fetch more and more organizations on board, enhancing the reach of the institute and spreading the word about its rapid growth and great quality of students. Diversity in People and Experiences: The most interesting thing I’ve come across here is the diversity of people you get to meet at an institution of national importance. People hailing from the length and breadth of the country, spanning across academic domains, vivid career trajectories and having vibrant hobbies and interests come together, work together and interact. Hence, collaborating with such diverse set of minds for official assignments, projects or unofficial interest groups is indeed a very fulfilling experience. As obtaining and valuing conflicting perspectives enriches our collective knowledge & widens our mindsets, IIM Amritsar I believe has been the best place for me to embrace all of that. Real-world Values: My stay at Indian Institute of Management Amritsar has been nothing short of an exhilarating roller-coaster ride where every twist and turn prepared me better for the life in future. To me, PGDM at IIM Amritsar has been like a challenging simulation game where a student gets equipped to face difficult crisis situations. Such problems demand strong presence of mind, problem-solving attitude and critical thinking over an extended period of time in order to arrive at a definite solution. Be it multi-tasking, time management, practical knowledge, soft skills, managerial acumen, creative thinking or any other skill a future manager must possess, IIM Amritsar will help an individual attain all of these over the course of 20 months. Infrastructure: IIM Amritsar is currently functioning at the temporary campus inside PIT, Government Polytechnic Campus. The academic campus has Wi-Fi enabled and IT enabled classrooms, a commodious auditorium, decent library full of offline & online journals, computer lab, football ground, bank, canteen, etc. Our hostel located at Ashberry Home in the outskirts of the city is as beautiful, serene and peaceful as it gets with its lush green surroundings & amazing skyline. Our Hostel has a Student’s Activity Area, Indoor Games Room, Football ground, Cricket Ground, Gymnasium, etc. that help us unwind after a hectic day. The hostel life is lively 24*7 where you find people roaming around or working any hour of the day. I would always cherish late night assignment discussions, cooking Maggie & coffee from night canteen with my friends. Student Culture: We always boast about our bustling student and rightly so. We are about 200 odd people with eight committees, 5 academic interest groups, 1 centre of entrepreneurship, 3 non-academic interest groups that have successfully organized 2 annual management-cultural-sports fest- AArunya, 2 Independence day marathons, 8 annual conclaves, countless festival celebrations, 2 flash mobs, numerous guest lectures, 1 TedX talk, 1 Alumni meet, and many more. The intra-college cultural, sports & management events that happen at regular intervals bring life to the campus and with it comes a lot of learning and interaction. Refer: https://instagram.com/iimamritsar?utm_source=ig_profile_share&igshid=e8h1colcuhyb to get a closer look at the zest and gusto of our student culture. The Holy City of Amritsar: All adulation I have for this city falls short and one has to live here only to experience the magic, spirit and vibrancy of the beautiful, Holy City of Amritsar. Be it the magnificent & serene Harminder Saheb, thumping patriotism at Wagah Border, the aromas of popular food streets, the Sikh benevolence at langars, vivacious Lohri celebrations and warm, joyous vibes that the locals have is addictive. Note: All pictures are a courtesy to 50mm-The Photography Club of IIM Amritsar. 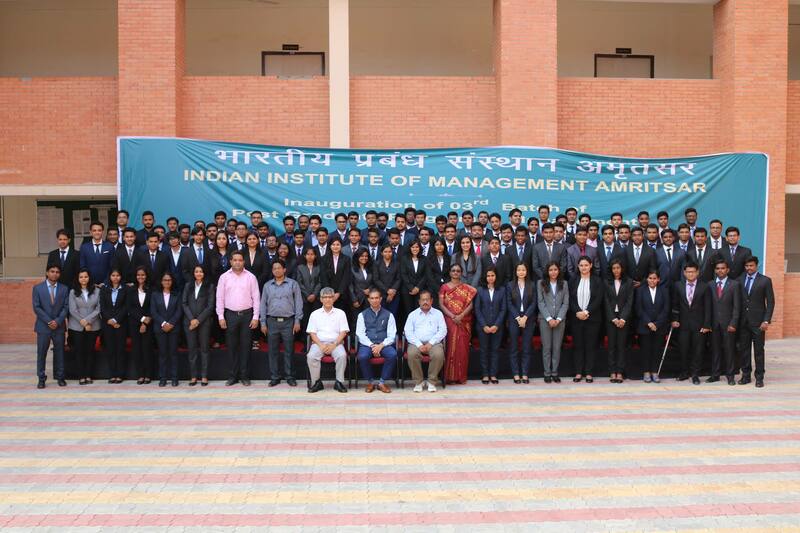 So, here I conclude my experience & perspective of being a part of IIM Amritsar, a budding institute, of which I will forever be proud to be a part of. Well described. 🙂 A thought provoking article. Useful piece for students willing to explore IIM Amritsar’s work & culture.